Our choice from these varieties of beautiful peafowl: Blue, Black Shouldered, White, Pied, Spalding, Cameo, Oaten, Purple, & Silver Pied. We will send you 2 different varieties of 3, 4 or 5 straight run chicks. We cannot take orders for specific breeds. 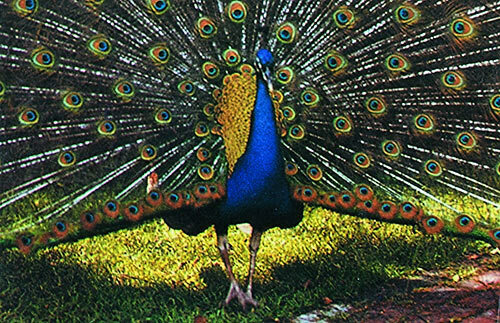 This is a wonderful way to get started in the fascinating world of raising Peafowl. The temperature at floor level in the brooder needs to be 95-97 degrees for the first two weeks, gradually reducing the temperature by raising the heat lamp. They will remain in the brooder for up to 8 weeks. Use a good thick layer of pine shavings for bedding. You will want to clean their area often. It is best to keep them off of dirt for the first year, for disease control. You will feed a Gamebird or Turkey Starter Feed. The first day you can sprinkle a very finely chopped hard boiled egg over their feed to get them started. Our Quik Chik vitamin and electrolyte water supplement is also recommended. Peafowl are no longer available for our Canadian customers. Honest, helpful companyThis is a great organization to work with. I was treated as a valued customer and I appreciate it.